The goal of A Golden Wish is to raise money to support the Morris Animal Foundation’s Golden Retriever Lifetime Health Study, which is the first project to come from their Canine Lifetime Health Project. Through this study, researchers work on life-saving research to better understand, prevent and treat cancer, and other medical conditions, in Golden Retrievers and all dogs across the globe. In support of their amazing research, A Golden Wish donates 10% of every purchase to the Morris Animal Foundation’s Golden Retriever Canine Lifetime Study. A Golden Wish chose to partner with the Morris Animal Foundation’s Golden Retriever Lifetime study because of the amazing and groundbreaking work that they do. It’s that simple. 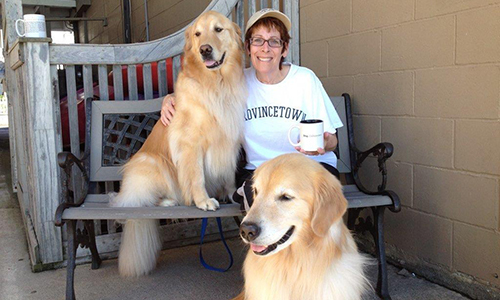 Founder of A Golden Wish, Faye Silverman, created this company out of pure love and devotion to the quality of life for Golden Retrievers everywhere. Although this cause is very close to Faye’s heart, providing the best quality care to her dogs is her life, which is why the Morris Animal Foundation was the perfect fit. The Morris Animal Foundation has invested over $113 Million toward the advancement of research to improve the health and lives of dogs, cats, horses and wildlife on a global scale. Through their research studies, the Morris Animal Foundation has funded and performed better health prevention methods, treatment protocols, and even some cures to help improve the lives and quality of life for animals everywhere. According to the Morris Animal Foundation, “Some of these breakthroughs have become industry gold standards and are used in every veterinary practice in the country.” The Morris Animal Research Center’s Canine Lifetime Health Project is “helping dogs live longer, healthier lives” everyday. The goal of A Golden Wish is to raise money to support the Morris Animal Foundation’s Golden Retriever Canine Lifetime study, which is the first project to come from the Canine Lifetime Health Project at the Morris Animal Foundation, located in Denver, Colorado. Through this study, researchers work on life-saving explorations to better understand, prevent and treat cancer, and other medical conditions, in Golden Retrievers and all dog breeds. Every dog, every owner, every veterinarian makes a difference in this ground-breaking study by providing information to the Morris Animal Foundation. The Golden Retriever Lifetime Study researchers use information from the enrolled 3,000+ dogs to investigate how genetics, nutrition, environment and lifestyle impact major health outcomes, especially cancer. Learn more about the Morris Animals Foundation.